No. 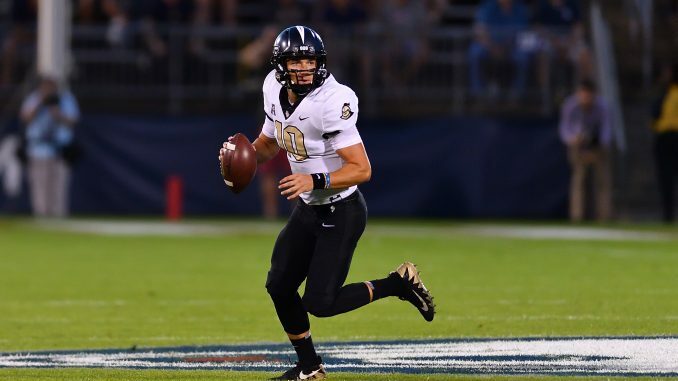 19 UCF makes its long-awaited return to Spectrum Stadium on Saturday when it hosts South Carolina State in the first of four straight non-conference games. It will be the Knights’ first home game since last December, when they won the AAC Championship Game over Memphis. UCF (1-0, 1-0 AAC) is coming off a 56-17 road victory over UConn last Thursday that extended its nation-best winning streak to 14 games. But now, attention shifts to the Bulldogs, who last visited Orlando in 2016 for the debut of Scott Frost. In that game, the Knights came out with a 38-0 victory. South Carolina State’s designation as an FCS program makes them easy to write off, but the Knights know what can happen if they are caught looking ahead. Milton, who is receiving local and national buzz as a potential Heisman Trophy candidate, got his 2018 season off to a fast start last week. While his five touchdown passes matched a career-high for a single game, he also continued to show off his mobility with 50 rushing yards. His performance earned him the nod for AAC Offensive Player of the Week, but he quickly deflected the credit to the players around him when asked about it on Monday. Tre Nixon, an Ole Miss transfer, caught five passes for 101 yards and two touchdowns in his UCF debut, Otis Anderson scored two touchdowns on just five touches and the offensive line kept Milton clean by giving up no sacks. Despite the uncertainty surrounding the new coaching staff heading into last week, UCF’s offense looked every bit as dangerous as it did in 2017. After Milton finished his night, redshirt freshman Darriel Mack Jr. saw his first collegiate action and impressed with a 70-yard touchdown run. It was the second-longest touchdown run by a quarterback in program history. With UCF having a 99.1 percent chance of winning on Saturday (per ESPN FPI), Mack could potentially see some more playing time in the second half. On the other side of the ball, the Knights underwent a lot of changes. It was their first game without Jamiyus Pittman, Tony Guerad, Shaquem Griffin, Chequan Burkett and Mike Hughes, so growing pains were a reasonable expectation. The defense had moments where it struggled, but the unit forced three turnovers to offset the 486 yards it allowed. Even with the turnovers, Heupel expects the defense to be better this week, especially when it comes to tackling and containing the quarterback. UConn signal-caller David Pindell rushed for 157 yards last week. Senior linebacker Pat Jasinski led the defense last week with 11 tackles and a forced fumble, while redshirt sophomore safety Richie Grant recovered a fumble and hauled in his first career interception. South Carolina State lost 37-6 to Georgia Southern in its season-opener last week, but UCF is focused less on what its opponent is doing and more on what it can do to improve each and every week. Kickoff for Saturday’s home opener is set for 6:03 p.m.